Highlanders Are Suffering from a Disease Which Just Now Threatens	Atlanta, Says Allen Sangree. Griffith's Pennant Aspirants Leave for Macon To-Day, and All the Players Are Glad of It. Special to The Evening World.) ATLANTA, Ga., April 5.--On to Macon!" was the cry this morning, the word cry, being quite suitable. More than half the team reported at breakfast their eyes piping a moist, pinkish blind, so that they could scarcely tell kippered herring from oatmeal. "What the Sam Hill is wrong with you boys?" demanded Griffith savagely. "Broke training?" "Dinged If I know," returned the watery-eyed men mildly, as each brushed a sleeve across his classic brow. Dave Fultz was in a deplorable sharpe. He could scarcely see. Jimmy Williams's sparkling orbs were mere pin points, while our friend Harold, of first base fame, had in be led to the table. It was not until "Kid" Elberfeld marched in, tongue bulging his cheek, his smile triumphant, that Griffith learned the truth. Yesterday the "Kid" reported from his farm in Tennessee, four days late, to encounter the manager's wrath. "Griff," said Elberfeld, "I'm In awful shape. I've got the pink eye. That's what kept me." "You've got a pink nerve," snorted Griffith. "I've a mind to dock your salary. Pink eye! Nothing but animals have that." "All right," said the "Kid." "I'll bet this team bats about 25 per cent for the next week. Pink eye is contagious. It stops schools and wrecks whole villages. You'll see!" The "Kid'. seemed to revel in the thought that he had imported something novel; in other words, that he had It on the manager. 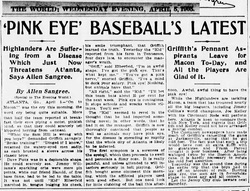 Griffith is now thoroughly convinced that people as well as animals may have pink eye, for the disease is spreading so rapidly that the whole city of Atlanta is likely 'to be infected. The first symptom is a soreness of the eyeball, which then proceeds to swell and percolate a filmy ooze. It is really painful, and unless attended to will interfere seriously in ball playing. Griffith bought some ointment this morning, which the afflicted players used with good effect. But one need look for little clubbing of the ball this after noon. Awful, awful thing to have the pink eye! While the Highlanders are tackling Macon, a team that has trounced nearly all the big leaguers, including Jimmy Collins's world champions, Joe Kelley with his Cincinnati Reds will perform here, Atlanta is keen to compare them with New York, and regrets that Griffith and Kelley could not have arranged a mortal combat. cold feet. The fact was that such a trip would hove cost an extra $1,000 with no guarantee and Frank Farrell thought it poor business. After being walloped twice by the Boston Americans. it is hardly necessary to refute the cold feet assertion. Yesterday was the second time during the entire trip that the boys had to lay off on account of rain. Barring pink eye, the men are in formidable shape to meet any and all comers. Let the Jersey City club beware next Saturday.